Not by defections from the NFL — either of players or audience. News like this is (so far) falling into the business-as-usual folder for most who love the pro game, inside or out. The nation’s largest youth football program, Pop Warner, saw participation drop 9.5 percent between 2010-12, a sign that the concussion crisis that began in the NFL is having a dramatic impact at the lowest rungs of the sport. According to data provided to “Outside the Lines,” Pop Warner lost 23,612 players, thought to be the largest two-year decline since the organization began keeping statistics decades ago. Consistent annual growth led to a record 248,899 players participating in Pop Warner in 2010; that figure fell to 225,287 by the 2012 season. The ESPN reporters who wrote that, Steve Fainaru and Mark Fainaru-Wada report that without being sure what drives the decline, the threat of long term brain damage is likely part of what’s keeping parents from enrolling their kids in the sport. Sounds right to me — as the parent of a sports-averse 13 year old, I haven’t had to weigh in on this, but there isn’t a chance at all that I would let my kid play tackle football (and I have my doubts about soccer, too, as it happens). I’m sure I’m not alone. The article goes on to talk about some changes the Pop Warner folks are thinking about — the big one being a suggestion to ban the three point stance for linemen. That move isn’t happening very quickly. It may come about, and such a change might tip the scale for some families. But let’s say football goes some large part of the way towards boxing, becoming (what it once was) a more minor, more geographically constrained sport — especially for the youth and high school game. Say a couple of school systems, and maybe a few universities, get sued for malign neglect of their student-atheletes’ interests. Suppose insurance companies start hiking the charges for liability coverage — or dropping it altogether — for the less financially robust nodes of the football-industrial complex. Won’t happen fast. Could come faster than many of us (me) imagine. Right now, like lots of folks, I’m still drawn to football. I still feel excited if I’m at a bar and see someone break something big. But increasingly I can’t sit down and watch a game. It feels like I’m looking at slow-motion executions, and I don’t like that one bit. Not with a bang, folks. With some moms and pops deciding not to sign a permission slip. With an insurance bill that the (X) Unified School District can’t pay. And yeah, in part, with just a little too much prime time exposure of still young men who can’t remember why they got into the car to go they can’t remember where. 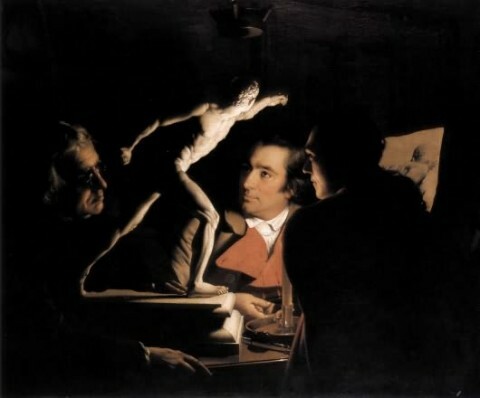 Image: Joseph Wright of Derby, Three Persons Viewing the Gladiator by Candlelight, 1765. This entry was posted on November 14, 2013 at 12:08 pm and is filed under Sports. You can subscribe via RSS 2.0 feed to this post's comments.